‘Lo again. 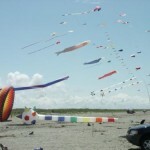 Every year, traveling partner Charly and I go to several Kite Festivals. Each has its own charm and delight, and we really enjoy them all. This time out, it was a mid-sized one on the Pacific Coast about 10 miles south of Westport, Washington – near the tiny community of Grayland… I don’t have much to say – pro or con – about the burg of Grayland, since we didn’t stay there. But the festival itself was a dandy! Next morning, well rested and well fed, we make it the ten miles to the beach in fine style. 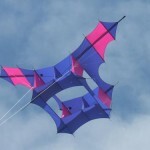 Already the Single-liners to the south of the entrance have the sky filled with a fine array of kites – everything from off-the-shelf Eddys to hand-made cellulars, a few big foils complete with line-laundry, and a fascinating variety of everything else. In actuality, we were quite pleased to see the number of single line kites (SLKs) there, since other festivals we’ve attended haven’t seen anywhere NEAR this number of either people or kites. Moreover – what was refuted to be “dirty weather” (wet and blustery) was nowhere in evidence, with clear skies and steady breezes that would remain with us throughout the festival – always a good thing! 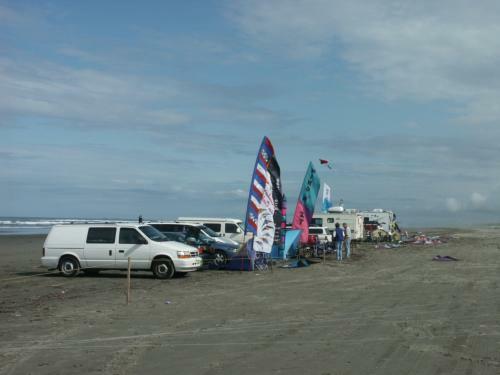 North of the entrance and the Registration trailer, we pass several event-vendors booths and a free-fly field, and park on the beach near the competition fields. This is an AKA Sanctioned competition event – so there’s a good contingent of competitors there, and the events are already underway when we arrive. 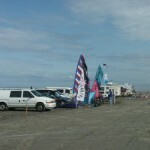 As usual, the Westport Windriders have done a fine job in organizing and set-up. The fields are all lined, the announcement and scoring booth is up and going, plus there’re a few handy port-a-pottys. There’s even an extremely “localized” FM radio transmitter going, so you can listen to the music and announcements on your car radio as you watch. Pretty neat! 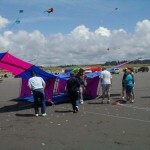 The Westport Windriders – sponsors of this event – is one of the more active kite clubs in our state, with some good reasons. First off, Westport is a fishing and resort town right on the coast – which means they have access to loads of great wind on superb beaches. 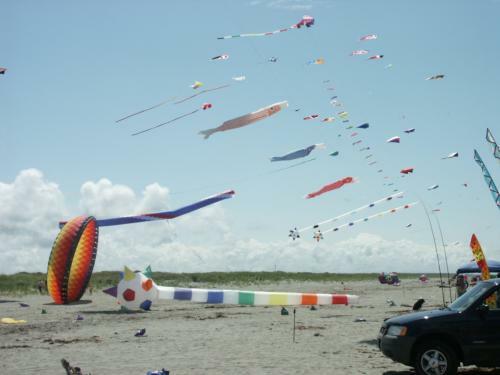 Grayland Beach is one of their “local” flying fields, free of obstructions in prevailing winds for about 6,000 miles. 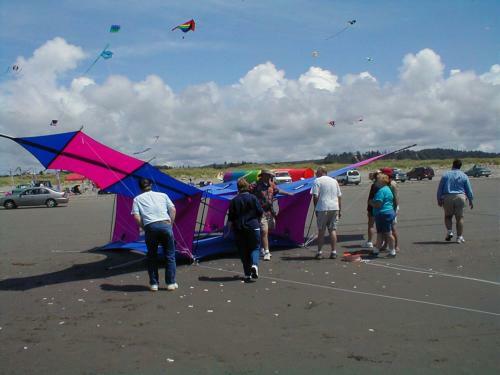 Also, the town of Westport and surrounds tends to be a bit of a “retirement” community, so you generally have long-time kiters as active club members, and they’re there year-after-year, enjoying each other’s company and gathering together for off-the-cuff flies as well as organized events… Nice! Charly, as the Washington Kitefliers Association (WKA) President, has a meeting with someone he’d agreed to meet “on the beach,” so he heads off to take care of business, and I spend some time with John Barresi, Kitelife’s Editor and Publisher – who’s here competing, along with his traveling partner Moon Kushner. John’s forgotten to bring his morning coffee, so I go in search of some in Grayland, and find an open deli that will fill my Thermos. We’re shortly drinking coffee and talking Kitelife business. I don’t want to swell John’s head any, but discussing Kitelife with “the man” is one of those simple pleasures we have a chance to do too infrequently – so we kick around some magazine ideas, and watch the comps at the same time. What a delightful way to start the morning. Soon, I have to leave to attend a WKA Board meeting, also on the beach, so I head down to the SLK area where I spend an hour or so discussing this and that and voting on a few things. Kiters are such nice folks to deal with. I’d already spent some time admiring a lovely Conyne Delta built by a couple of friends – Glenda Kleppin and her partner Jerry Graham. 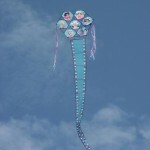 They travel to festivals with about 100 kites – give or take. And I also happened to spot Sam and Ann Houston flying their marvelous creations. Sam’s a marvelous kite-maker and does some awfully creative cellular stuff, and I also meet Deb Cooley for the first time. 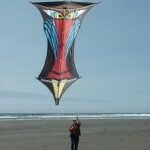 Deb is a long-time Oregon kiter and kite-builder, and was displaying a “farm” of what she calls “Twizzlers,” quite similar to the mini-banners that Frank Schwiemann over in Germany makes. I also stopped and yakked with the Sheriff’s Patrol Volunteer folks, asking about the local Firemen’s big Barbeque Feed we’d seen signs for on the way in. They admitted to not knowing much about it – save for for two things – where it was, and what they were serving. Dang it! That’s the only two questions I had, too! So, having been on the beach for over four hours now, I went and grabbed Charly, and we two headed off to lunch at the Volunteer Fire Station! Just before we left the beach we happened to glance down at the SLK field, and noticed that a HUGE Cody was down there where we could get a good look at it. A quick detour down the beach got us within shooting range, and I managed to pull a couple of shots of this baby… With theinevitable mob around something that large, we never did get a clear shot of the kite on the ground, so with stomachs rumbling – we simply grabbed what photos we could get, and headed for the Fire Station instead. After lunch, I figured I’d spent enough time with the SLK folks for a while, so decided to hang with the Competition contingent for the afternoon. When we go to kite-fests, we often see the same folks at each event, since many of the festivals we attend are also competition events in our region. Because if it, we’ve come to be good friends with folks like Team Sixth Sense and Team Cutting Edge, two of our “local” teams. I amaze them all every now and then and actually embarrass myself by throwing a kite in the air within their sight… but folks like these are indeed far above my capabilities as a pilot. So we stood and watched the Experienced-level dualie pilots compete in Precision and Ballet for the remainder of the afternoon. If our area is any indication, I’m pleased to report that there’re quite a few very capable pilots coming along, working their way up to running against real Masters like Rick Wolcott and John Barresi – two who’ve actually won it all nationally… Soon – mostly due to the great flying weather – the comps actually finished early, and Charly and I headed off to the Ocean Avenue Inn again for a shower, a short nap, and to get ready for the event “banquet” that night. After chow’s done, the sponsoring organization’s spokesperson gets up and starts the after-dinner ceremonies. First up is the announcement of, and awarding of the prizes for, the day’s competitions. 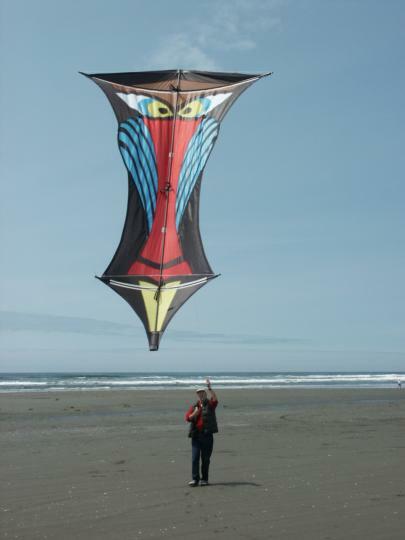 While I knew many of the sport kite competition winners, I was particularly pleased to see Ellen Pardee win the Grand Prize in kitemaking for her Seven Sisters. 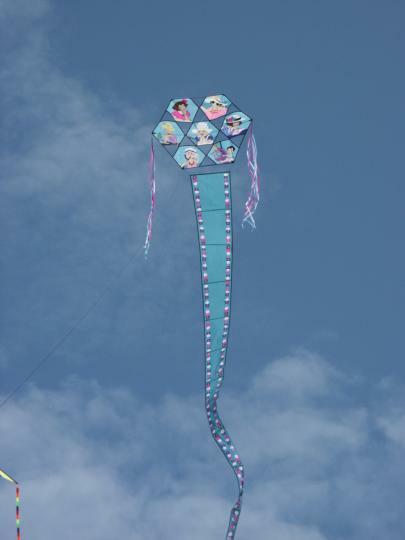 It’s truly a marvelous kite in the air! At this particular banquet, they also give out their “club” awards, and I was absolutely delighted to hear that Susie Christienson had won the Westport Windriders “Lifetime Achievement” trophy. And where was Susie when her name was announced? Why, back in the kitchen – doing dishes for 200 people, that’s where! Following all those announcements, we got to the real “meat” of the thing – the raffling off of about 100 items, large and small, of kites and kite-related paraphernalia. 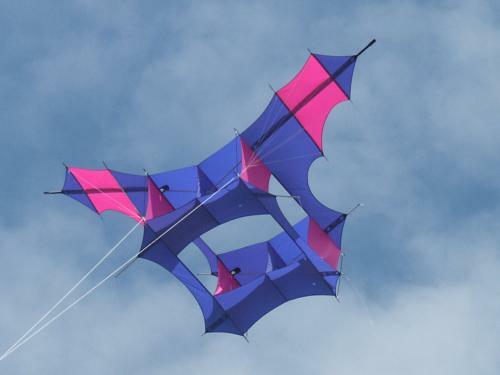 When I say “small” I mean Charlie Sotich “Mini-kite” small (2 of ‘em went), and when I say “large” I mean 5 meter parafoil and eight-foot span Cody size (1 of each). And the Auction items raised a couple of thousand dollars for the club, too! All told, those Windriders did all right – and I had a grand time with the people and left with a full belly and a smile. What more can anyone ask? More rest, recuperation, and another excellent breakfast after out motel check-out got us on the road to Grayland about 9:00 the next morning. It’s another typical Northwest clean, crisp morning with decent breezes – which suits everyone just fine. By the time we get there, the comp guys are setting up and ready to roll. Today’s the day of the Masters level competitions. Down at the SLK fields, a quick glance shows less in the way of airborne delights than we’d seen there on Saturday, and I was somewhat saddened to hear that some of the Oregon contingent had gone south, rather than staying overnight. Well… I suppose I can understand that, but I still missed the “magic” the Oregon ladies always manage to throw in the air at any sky-festival. Besides, I’ll bet there were some Washington and British Columbia kite fliers and kite makers that slept in their own beds the previous night – it wasn’t all Oregonians… We know you’d spent a couple of days there already, and your comps were all over, but some of us missed your bright smiles and glorious kites! Back at the Competition Fields, the Master’s Precision comps had ended, and the Ballet comps were underway. Why do we make so much “to-do” about these competitions? Well, because so much of the organized kiting world is involved in them… So – If you’ve not watched the Precision and Ballet events before, please take the time to watch a couple at the next competition you attend. During Precision comps, the stately beauty of the patterns can be quite lovely. (Yeah, and we’ve all heard pilots gripe about the difficulty of some of the figures, too!) Ballet – using a kite to interpret music – can be absolutely awesome for everyone, and the Masters level flying is the best-of-the-best! And if you get bored watching the “usual” stuff, just wait for the Pairs and Team competitions and the Multi-line comps… Awesome stuff! After John finished with his Open Multi-line Precision competition (which he won), he offered a “clinic” to other Multi-Line pilots, and adjourned to an adjacent field with 8-12 other pilots to show them a few techniques. Competition events are good times to offer clinics, because the pilots are there an interested in the subject-matter. John later said the clinic was mostly about helping others with specific tricks or “polishing” their basic technique, but I guess he did have one pilot who’d never flown a revolution before. Check out the photo gallery in this issue! This entry was posted in 2004, Events / Festivals, Issue 37 (Jul/Aug), KL Archive, Reports and tagged festival, westport, Windriders.